Greg Milo has worked for 13 years to take high school social studies beyond the usual and mundane, writing curriculum, creating courses, and developing experiences for students that are engaging and applicable for a future that demands creativity and critical thinking skills. Chapter 2: What’s Missing? Why do Students Hate history? This work serves as an inspiration for Social Studies teachers looking for ways to innovate teaching and learning for their students. Such efforts will help develop an informed and engaged citizenry who think critically about the complexities of the world in which we live. Milo provides the tools and inspiration for educators to liberate themselves and their students from the confines of the traditional textbook-oriented study of history and society to one of experiential understanding of our world. As a seasoned acclaimed teacher, Milo challenges traditional curricular approaches with his unique and pragmatic strategies to bring back interest and curiosity, allowing the students to think critically and be problem-solvers in our constantly changing world...a must read for all teachers! Listening to human beings comes first for Greg Milo, according to his book, Rebooting Social Studies, which informs instructional approaches to engage students in complex brain activities, such as analysis, synthesis, and evaluation, as modes of inquiry based learning. Milo inspires student use of information to make sense of historical facts and contexts. 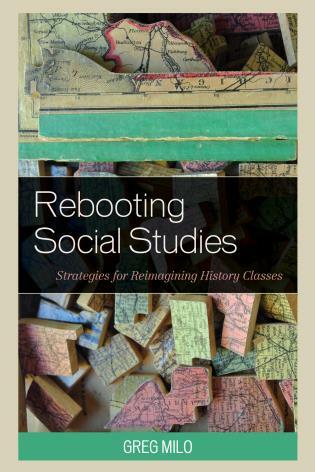 Rebooting Social Studies contributes engaging approaches to augment the marginalization of social studies curriculum in the current educational era.